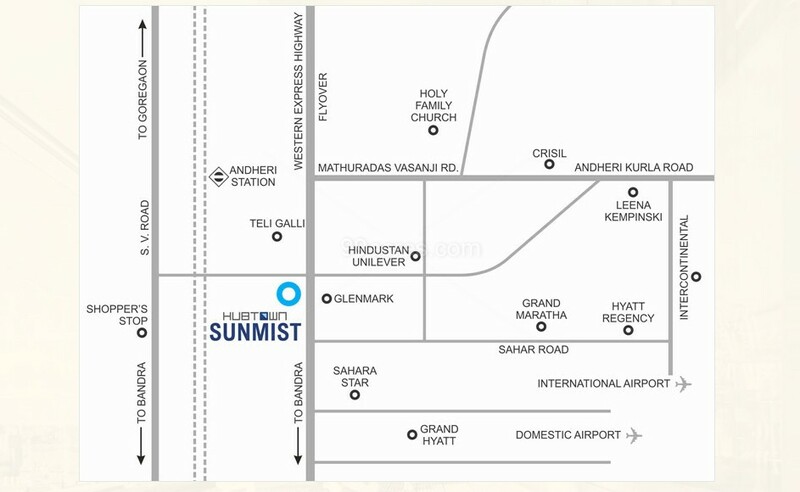 Located in Mumbai’s largest and ever growing suburb Andheri Hubtown Sunmist definitely attracted a fair amount of praise for its external facade. By focusing on a severe, almost corporate, sharp-cornered design it managed to stand out from the crowd of Hiranandani and Kalpataru copies and sculpted concrete efforts. According to Economic time report released recently, “Home buyers in and around Chandivali, Andheri and Sakinaka are having a tough time getting the possession of their property because of multiple problems. Either the government is delaying giving permissions or the registration takes time forever or the builder is struggling to finish the project in time because of the cash crunch. "The builders are facing a lot of issues in sourcing funds for completing projects," said Arjun Thakkar, a real estate consultant based out of Andheri East.” It is learnt Hubtown Sunmist a victim of one of these issues had an initial possession date of December 2013. 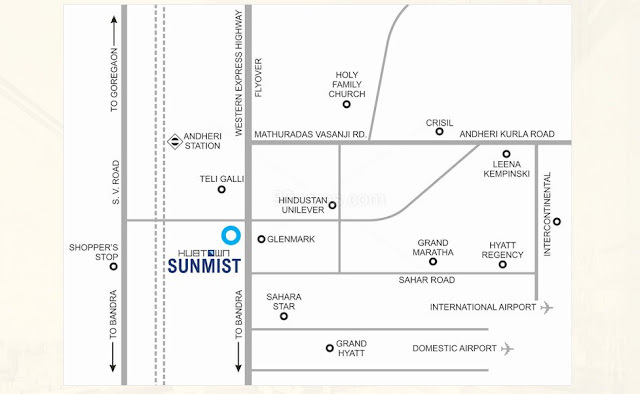 The location is perfect if you are someone who works in the suburbs of Mumbai. Connectivity wise it doesn’t get better. However, the same boon happens to be a bane if you have a young family. Be ready for traffic jams and noise every morning. This is one of the most active junctions in Mumbai and is certainly one of the busiest parts of the Andheri suburb. If you can live with this fact Andheri station is close by, you are close to the Metro (all at walking distance). You will have to depend on Andheri west for your shopping needs since these residential apartments are right in the middle of Andheri Business district. The plot shape is quite regular and with adjacent roads on three sides, its exact locality is very nice. Since the plot area is a bit less and it’s a standalone building, the open areas will be limited. So, there is a certain give and take involved between location and layout here. 2BHK : The 2 BHK has an entrance lobby which opens up into a spacious living area of 22*11 with a separate 100 sq ft + dining space which can easily accommodate an 8 seater dining table. The kitchen is huge again with 2 separate counter slabs. A master bedroom of size 11*18 is ‘luxury’. 2 big washrooms and huge utility space for your storage space and a 21 feet deck. Need we say more. It’s spacious! 1. The living room is spacious with the balcony, puja room & dining area. 2. The kitchen is big and attached with dry balcony. 3. The general bedroom is of ok size. 4. Another bedroom is a little bit big compared to general bedroom attached with toilet. 5. Master bedroom is very spacious attached with balcony but the layout is not that good because the passage. 1. The living room is small if we see as 4 BHK apartments. 2. General bedroom & toilet is of ok size. 3. Another bedroom and other master bedroom is spacious. 4. Other master bedroom layout of the window. 5. Master bedroom is very spacious. 8. Passage area which is given is a good idea and can be utilised nicely. 1. We like floor plans of the project, the living room master bedroom, and other bedrooms are very spacious they all are having the huge as well. 3. Noise proof windows in the whole apartment. 1. The junction it is at is most certainly the busiest part of the suburbs - I'm pretty sure there will be traffic jams (and hence the noise) up to 11pm every night. 2. Per sq. ft. price for this project is much higher than compare to the average price in Andheri east region. Great planning. 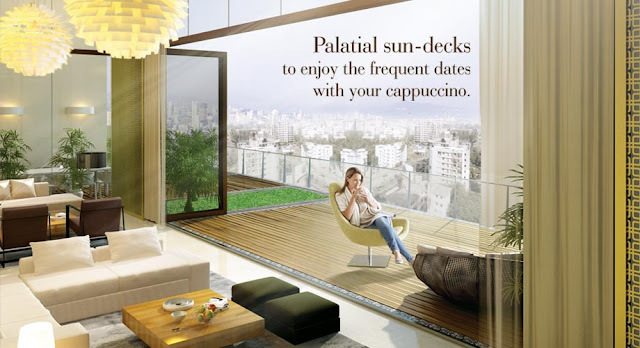 Large size apartments with big decks is a dream for every housewife in Mumbai, however, it’s an SRA project where the developer was allegedly struggling for money and clearances. If you have an office space in BKC / Andheri and can live with some traffic go for it after negotiations.